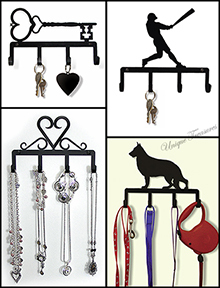 Our key chain holders, leash hooks are made of wrought iron and have the perfect size hooks for hanging a variety of small items, such as key rings, necklaces, leashes, belts, or use your imagination. Always misplacing your keys? Need to hang special jewelry or belt hooks? These wrought iron / cast iron / metal hooks will solve your problem. We have a large selection of silhouette styles. Our dog breed key holders work great as storage hooks for your dog's leash.